John C. Maxwell, best selling author and motivational teacher, is known for his brilliant insights into the nature of leadership - and how we can tap into unfound abilities within ourselves. His new audiobook turns to the wellspring of tradition, as he offers inspiration, learning, and the power of prayer from the lives of Old Testament heroes.In the race of life - a contest of stamina, endurance, faith, and understanding - we are never alone. Others have run it before us. In John C. Maxwell's vision of humanity, they are in the stands, urging us on, praying for us, and offering the wisdom of their experience. We need only listen for their voices and hear their stories to turn our modern-day challenges into victories.From Rebekah to David, Abraham to Moses, Running with the Giants puts us face to face with the towering figures of the Bible. 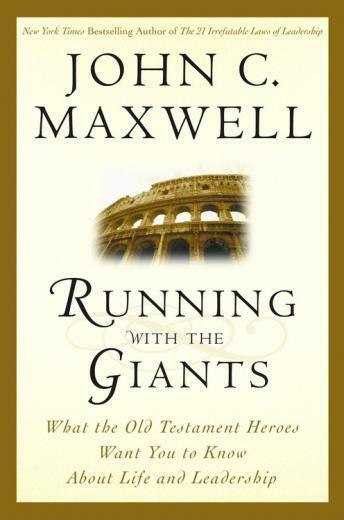 From these great heroes - and from the inimitable John C. Maxwell - comes the inspiration to live as they did: as leaders, as success stories, and as people close to God. This book has changed me in how I view life and important lessons that can be learned from the Bible. I would recommend it for anyone who wants to grow spiritually and in character. I enjoyed listening to this audio book. It provides great information and references from the bible.